Finally, I get to share more about The Cornettes – Advocates for Urban Agriculture thanks to a Midwestern panic (and now a two foot reality!) about snow. Here is our back yard and front yard this afternoon. Bring it on! WGN Around Town with Ana Belaval and The Cornettes - (L-R) Lin Shook Schalek (founder, choreographer, dancer of Perception Motion, Inc), me, and Stephanie Samuels (artist and proprietor of Angel Food Bakery). Those two dear friends met me at the studio at 6:00 am! Firstly, I am going to finally give credit to Phyllis Gilmore for naming The Cornettes. Phyllis is an Activity Director I have been working with for nearly a decade in the recreation therapy/consulting part of my life. She is a creative at heart and when we were talking about naming “my girls” she exclaimed “How about The Cornettes?!?!? !” … and so they were named. Fast forward a few weeks later and there was Phyllis listening/watching Around Town with Ana Belaval of WGN and they announced “Up next, The Cornettes!” She spun around in her chair to see none other than The Cornettes on am Chicago TV! Thanks so much Phyllis! The three Cornette costumes (following Summer Sweet-the first Cornette before The Cornettes were The Cornettes) were commissioned by the Chicago Office of Tourism City of Chicago Dept. of Cultural Affairs. (The City of Chicago Department of Cultural Affairs has been an amazing support to many local visual and performing artists.) Check out their Chicago Artist Resource site. Annie Abdelnour, Jorkill Almanzar, Zoe Anderson, Sarah Aubry, Helene Alter Deich, Jennifer Dotson, Nicole Gotthelf, Vickie Hayes, Nancy Little, Colleen Lovinello, Amber Mathews, Susan Melcher and mother Sue Melcher, Donna Neuwirth, Lindsay Obermeyer, Corinne D. Peterson, Galadriel Rosen, Ariel Rubin, Stephanie Samuels, Lin Shook Schalek, Mary Lou Wehrli, Sojourner Wright, Jiyeon Yim, and Mary Zehnder. Thanks everyone! You have worn the costume well. Some may know that the kernel is the female part of the plant. Here is a clear explanation of the botany of the lovely an ancient Zea Mays. That is why we introduced Paul E. Nator (worn by Bart Conklin, summer intern from UW Platteville in 2010) in 2010. We will see how the tassel fits in while juggling wooden corn cobs in future appearances. First, they look lovely don’t they? In this world of “entertain me” though that clearly has not been enough! They tell corny jokes, corn facts, talk about urban agriculture and growing their own food (especially keeping urban chickens – yes it is legal! ), and plenty of photo opportunities. 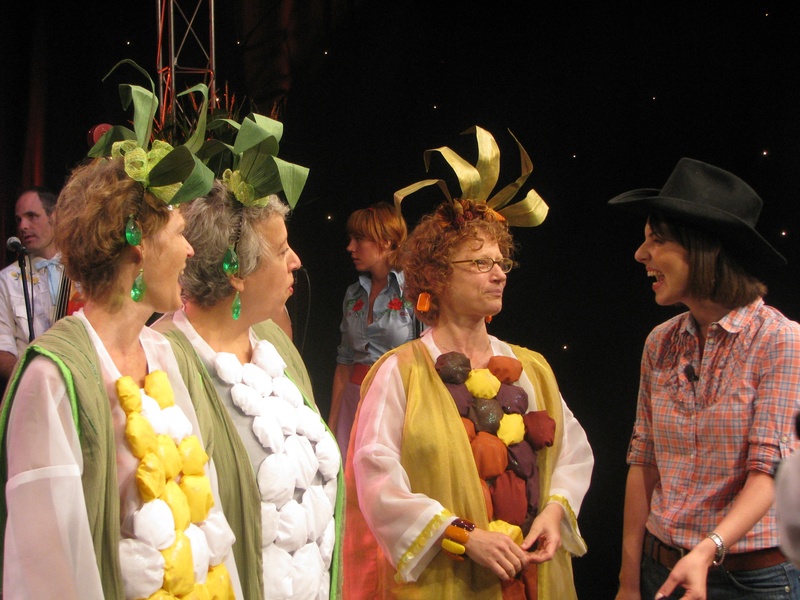 In 2010 we debuted their song Let us Grow Some Sweetcorn, sung to the tune of Let me Call you Sweetheart along with Paul E. Nator the corn juggler. The conversations with people from around the world and in Chicago high rises have been wonderful. See one here. Talk to me. If you enjoy being with people, love to be a ham, and have a passion for growing your own food and educating others about food systems, you are most of the way there! I am always looking for new talent! Honestly, some of the events are paid and I share the income and some of the events are “guerilla” ie. unpaid but very necessary to call attention to our food and growing needs and issues thereof. How could I book The Cornettes for my event? Write to me via this blog by commenting. Let’s talk about your needs, your event, and how The Cornettes – Advocates for Urban Agriculture can add some fun while learning about growing one’s own food. I hope you have enjoyed some of the wonderful images over the last couple of years and look forward to Dakota Black Popcorn, the final Cornette addition in 2011! She is going to be beautiful!!! Phyllis! You know that you deserve it! From one creative sister to another! Thanks again woman. cornetts! cornetts! Any corny jokes this year?? My Sweetheart... please send jokes from Korea... the cornfield needs your help!